A sign on the beach near the Mexican border where the Tijuana River meets the Pacific Ocean warns of dangerous pollution. Foamy, yellow plumes of toxic sewage are belching onto California’s beaches and waterways near Mexico, eating into the boots of border agents, sickening swimmers, and shutting down tourism. Raw sewage, solvents, and trash from the Tijuana River in Mexico have prompted San Diego water authorities to urge state health officials to examine the risks to state employees and beachgoers, particularly in the border city of Imperial Beach. The toxic flows have breached the border for decades after heavy rains, pipe failures, or even wind changes. But they’ve intensified recently as the population booms on the Mexican side without a corresponding increase in sewer, water, and trash collection efforts. And budgeting problems and issues of jurisdiction are leaving state and local officials with few options. 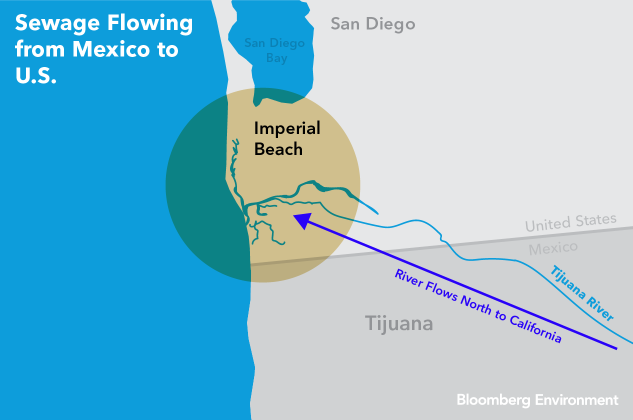 Imperial Beach Mayor Serge Dedina said March 21 while the border gets attention nationally, his concerns are not about migrants but the flows of sewage, industrial runoff, and trash. Beach closures are frequent, blocking the community off from the landscape and harming tourism, he said. Dave Gibson, executive officer of the San Diego Regional Water Quality Control Board, is asking the California Department of Public Health to examine the risks to state employees and beachgoers from pathogens and chemicals in wastewater and industrial flows, with a focus on Imperial Beach. “The water board is concerned about the health and safety of the public and for their staff that are exposed,” Gibson told Bloomberg Environment March 21, with mosquito-borne diseases and inhaling contaminated air also a concern. Dedina, the Imperial Beach mayor, worries the beach will often be closed this summer if a solution is not found. The city of 27,000 is forced to rely on lifeguards, tide gauges, modeling, and Tijuana residents to tell them about sewage releases or dumps so they can avoid the yellow plumes in the ocean while surfing or swimming. Navy Seals train nearby at a new $1 billion facility and U.S. Customs and Border Protection agents are also constantly exposed. In addition to water rescues, Customs and Border Protection agents have to routinely check the grates on culverts and connectors to be sure they have not been cut. It requires wading into the water during wet season and kicking up dust during dry times, said Chris Harris, a retired agent who was also director of legislative and public affairs for his union. Harris said welts and rashes are not uncommon, and one agent had to medically retire in his 30s after almost losing his arm to a flesh-eating bacteria. Over a period of a few months, more than 80 cases of illness were reported by agents, he said. A draft CBP report shows that volatile organic chemicals, uranium, iron, chromium, pesticides, herbicides, and biological contaminants were detected. Much of the problem comes down to economics, faltering infrastructure, and jurisdictional questions. The U.S. Environmental Protection Agency’s budget for its U.S.-Mexico Border Water Infrastructure Program got $15 million this year to cover needs along the entire 2,000-mile border. The International Boundary and Water Commission is jointly operated by Mexico and the U.S. to focus on water quality, sanitation, and flood control along the border. A 2015 agreement on transborder issues recommended evaluating possible sewage treatment upgrades or projects but it has not been implemented, Gibson said. “There’s been a great deal of inconsistency with how IBWC has dealt with issues,” Gibson said. The water board and Imperial Beach have both filed lawsuits against the U.S. Section of the International Boundary and Water Commission over pollution and Clean Water Act violations. San Diego has joined the state action while the Chula Vista and the San Diego Unified Port District joined the Imperial Beach claim. The Surfrider Foundation also has a claim. Lori Kuczmanski, a spokeswoman for the commission, said she could not discuss transborder sewage issues because of the ongoing litigation. She was unaware if any report on proposed projects was on the horizon. Meanwhile, the water board and partners are working on a feasibility study to examine about 20 projects that could be done on the U.S. side of the border to collect, stop, or divert the waste coming from Mexico. “The reality is the local agencies have been tasked with trying to deal with what is really an international problem,” Gibson said.